I don’t know what it is about drinking and the holidays, but it’s like the flood gates are thrown open and people start guzzling bottles of champagne and wine like the apocalypse is coming. I can barely scroll through my social media feeds without seeing an alcohol related post. I get it people. You’re stressed out, you’re still pissed off about the election, you’ve had it with your boss, your kids are driving you crazy – you NEED a drink! Well, for those of us who have “been there, done that” we know that getting sloshed will never be the answer and we will do whatever we can to protect ourselves from the onslaught of “if I only had a drink” type of mentality being thrown in our faces. Yes, this is what people in sobriety have to deal with ALL OF THE TIME. Like it or not, we live in a society that is obsessed with drugs and alcohol. Just Say “No.”: I don’t mean, “just say no” to drinking (although that helps), but, before going, really think about the situations you put yourself in. Will there be heavy drinking? Will there be other sober people? Will I have supportive people around me? Can I leave easily if need be? If you don’t think it’s a good fit, politely decline and save yourself the trouble and temptations. It’s not worth it. Set Boundaries: Your sobriety should be your number one concern. If I want to attend a function where I know there’s going to be drinking, I stay for a certain amount of time and then leave. Typically, I don’t host gatherings at my home during the holidays because I don’t want the expectation of providing a full bar and I don’t want that kind of drinking taking place in my home. You have to be willing to stand up for yourself and your sobriety, despite what others want or expect of you. Don’t Defend Your Sobriety: The first Christmas I was sober I actually had a relative make a dig at my sobriety. I was drinking non-alcoholic wine because I wanted something “special” to drink and she said something along the lines of, “If I couldn’t drink, I wouldn’t even bother with that stuff.” I was so caught off guard I didn’t know what to say, however, I think my husband would have liked to thump her across the head. Sure, I could’ve told her how I hoped she would never have to experience what I did to get to that point in my life or I could’ve called her out on her own perceived drinking problem, but I didn’t because what I learned in recovery is that it doesn’t matter what others say, do or think. As long as I’m taking care of my side of the street, it’s all good. Trust Your Gut Instinct: Honestly, this is what I listen to most. If something doesn’t feel right, if you’re questioning whether or not you should do something or go somewhere, don’t do it. There’s a reason you’re feeling that way and usually that reason is for the best. Remember, We’re All God’s Children: Okay, so this one’s a little different, but it helps! I once had a sponsor who, whenever I would be complaining about someone, would kindly remind me that “We’re all God’s children.” So, now, when I’m driving in crazy holiday traffic or in line with grumpy holiday shoppers, I just remind myself to be patient, be kind and “We’re all God’s children” – even that grumpy lady! No matter how long we’ve been sober, I think it’s always good to go over some of these reminders during the holidays. If you’re new to this sober thing, don’t be afraid to reach out to other sober people along the way. We’ve been there and we know what it’s like to feel isolated and alone. But, one thing we’ll all tell you, is that you’re not alone! There’s millions of us out there who don’t drink and don’t HAVE to drink during the holidays. 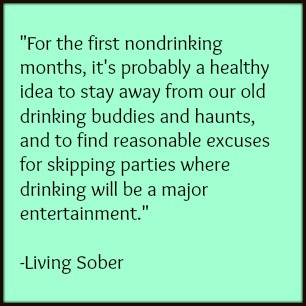 We’ve made the decision to have sober and therefore memorable holidays, ones we can be active participants in, not only bystanders. Just another gift of sobriety. I’d love to hear other ways you stay sober during the holidays! I am coming late to this, and of course holidays are over AND you’re preaching to the choir here, but I did love all of this. No need to defend sobriety – why would I need to defend being a vegan (I’m not) or other lifestyles? It is who we are, it’s what we do (or don’t do) which helps us to grow and to be in the sunlight of the spirit. I think the biggest thing is being able to say “no” or “no thanks” and realize that our sobriety trumps (oops ha ha) and hurt feelings. I agree – the holidays ARE hard when you’re surrounded by activities involving drinking and people and situations that you used to deal with by drinking. That option is no longer available but the anxiety is still there. This was my third holiday season sober and for whatever reason it felt even more difficult this year. Whew – it’s over! But soon the next holiday/event will be upon us and I’ve realized that life is a long series of “holidays” to be dealt with soberly. So again, I try to go back to that feeling of gratefulness that I’m no longer stuck in that horrible downward spiral and God has done for me what I could not do for myself. No amount of momentary relief of anxiety with a glass/bottle of wine would ever be worth giving up my new sober life. Thanks for your blog, Chenoa. I read your post it was very interesting and helpful. You have jotted out some of the best points to stay sober during holidays. Its a difficult time for everyone to maintain sobriety during holidays. The tips you have listed are of great help. Today marks 34 days of sobriety for me. I just read your article from Country Living. It hit me right in the feelers. I have two children 3 & 4 so I can completely relate to your story. I received a DUI at the beginning of November and it has been the greatest thing to ever happen to me in regards to my drinking. I have needed to get sober for a long time and it pushed me to step up to the plate. Thanksgiving 2017 is the first sober holiday I have had in over 10 years. I purchased bottles of sparkling cider and drank mine from a wine glass for the “fancy feeling”. It is so important to set boundaries and clear expectations for guests even spouses who continue to consume. Romans 8:37 But in all these things we overwhelmingly conquer through Him who loved us! Hi Kelsi! Congrats on over a month of sobriety – that is SO awesome! My kids were a similar age when I got sober and it gives me so much joy to know that they will never have any memories of me drinking. It’s such an incredible gift that you are giving them. Best wishes for the future! Good for you, Kelsi. It’s a decision that is life-changing and one that you won’t regret. Not saying it’s easy…some days are definitely harder than others. But that’s life. But pretty soon the days become months which become years, and it really does get easier with time. The longer I go, the more I realize how devastated I would be to give up all these days that I’ve strung together for almost 4 years. So just keep getting to the end of each day without anesthetizing your feelings with a bottle and you’ll be able to be very proud that you gave your children the gift of a sober mom. Thanks for your blog, Chenoa…for me, especially in the early days, I was so hungry for connection with other like-minded people and the online forum is very comfortable. Happy sober holidays to all!